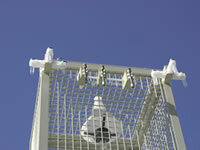 The air monitoring methodologies used in Gibraltar can be divided into three main types, covering a wide range of costs and performance levels. The methods and their relative merits are shown in the table below and discussed in the following section. Careful consideration has also been given in choosing the most appropriate monitoring location for investigating specific air pollution sources or problems. Passive Samping Low cost / simple. Useful for screening and base-line studies and in support of automatic monitoring for more detailed assessments. Unproven for some pollutants. Laboratory analysis required. In general, only provides weekly or longer averages, often with long data turn around times. Active (semi-automatic) sampling Low cost / easy to operate - reliable. Historical datasets available. Provide daily (or longer) average concentrations. Some methods are labour intensive. Laboratory analysis required, often with long data turn around times. Automatic point monitoring Provide high resolution data. On-line data collection possible. Relatively expensive. Trained operator required. Regular service and maintenance costs. Passive sampling methods (diffusion tubes) – These represent a simple and cost-effective method of monitoring air quality in an area, to give a good general indication of average pollution concentrations. They are, therefore, particularly useful for assessment against annual mean objectives. A sample integrated over the exposure time is collected by either deposition or diffusion to a sampler. For Diffusion tubes, the low cost per tube permits sampling at a number of points in the area of interest; this is useful in highlighting 'hot spots' of high concentrations, such as alongside major roads or near power generation. They are less useful for identifying 'hot spots' around point sources or near to industrial locations where greater objectives requiring greater temporal resolution is required (ie investigating hourly or daily objectives). Diffusion tube surveys are simple to undertake and minimal operator training is required. Diffusion tubes are used to monitor the following pollutants in Gibraltar: Nitrogen dioxide and volatile organic compounds (VOCs), specifically benzene, toluene, ethylbenzene and xylenes; collectively referred to as BTEX. The tubes must are analysed by laboratories that offer suitable quality assurance and quality control measures to ensure the results meet the data quality objectives defined for the method. The diffusion tube data is corrected for bias in the analytical results. Active (semi-automatic) sampling sampler methods – These methods collect pollutant samples either by physical or chemical means for subsequent analysis in a laboratory. Typically, a known volume of air is pumped through a collector such as a filter or chemical solution for a known period of time, for subsequent laboratory analysis. These include denuder samplers for gases and gravimetric filter samplers for PM10, PM2.5, metals, PAHs and elemental analysis. Sequential instruments with automatic sample changers are used for particulate sampling. Automatic real-time point analyser methods – These produce high-resolution measurements (typically hourly or shorter period averages) for oxides of nitrogen, sulphur dioxide, carbon monoxide and ozone. A gas chromatography (GC) analyser provides high-resolution data on benzene, and 1,3-butadiene. The sample is analysed on-line and in real-time. In order to ensure that the data produced are accurate and reliable, a high standard of maintenance, calibration, operational and QA/QC procedures is required. the types of pollution sources involved (which may be traffic, industrial emissions, or "background" i.e. not located close to any specific emission source). So, a site could be described as (for example) "urban traffic" – in an urban area, and close to a busy road where local concentrations of pollutants are dominated by vehicle emissions, "urban background" – in an urban area but well away from major roads and specific industrial emission sources, or "rural background" if it is in a rural area well away from emission sources. Any combination is possible, although some (such as "rural traffic" or "rural industrial", are likely to be rare). Continuously built-up urban area meaning complete (or at least highly predominant) building-up of the street front side by buildings with at least two floors or large detached buildings with at least two floors. With the exception of city parks, the built-up area is not mixed with non-urbanised areas. For the measurement of ozone, the urban area is defined as locations such as residential and commercial areas of cities, parks (away from the trees), big streets or squares with very little or no traffic, open areas characteristic of educational, sports or recreation facilities. Urban sites should measure air quality which is representative of a few km2. Largely built-up urban area. 'Largely built-up' means contiguous settlement of detached buildings of any size with a building density less than for 'continuously built-up' area. The built-up area is mixed with non-urbanised areas (e.g. agricultural, lakes, woods). 'Suburban' as defined here has a different meaning than in everyday English (where it usually means an outlying part of a larger city or town). Here, a suburban area can exist on its own without being part of a larger city. For the measurement of ozone, suburban areas include those where population, sensitive crops or natural ecosystems located in the outer fringe of an agglomeration are exposed to high ozone levels. Suburban sites should measure air quality which is representative of some tens of km2. Sampling points targeted at the protection of vegetation and natural ecosystems shall be sited more than 20 km away from agglomerations and more than 5 km away from other built-up areas, industrial installations or motorways or major roads, so that the air sampled is representative of air quality in a surrounding area of at least 1000 km2. Stations can be located in small settlements and/or areas with natural ecosystems, forests or crops. There are no areas within Gibraltar that meet these site definitions. Located such that its pollution level is determined predominantly by the emissions from nearby traffic (roads, motorways, highways). 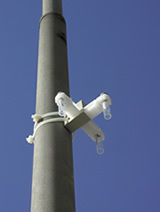 Air sampled at traffic sites must be representative of air quality for a street segment no less than 100 m length. Sampling probes shall be at least 25 m from the edge of major junctions and no more than 10 m from the kerbside. Located such that its pollution level is influenced predominantly by emissions from nearby single industrial sources or industrial areas with many sources. Industry source is here taken in its wide meaning including sources like power generation, incinerators and waste treatment plants. Air sampled at industrial sites must be representative of air quality for an area of at least 250 m × 250 m. The sampling point shall be installed downwind of the source in the nearest residential area. Located such that its pollution level is not influenced significantly by any single source or street, but rather by the integrated contribution from all sources upwind of the station e.g. by all traffic, combustion sources etc. upwind of the station in a city, or by all upwind source areas (cities, industrial areas) in a rural area. These sampling points shall, as a general rule, be representative for several square kilometres. At rural background sites, the sampling point should not be influenced by agglomerations or industrial sites in its vicinity, i.e. sites closer than five kilometres.